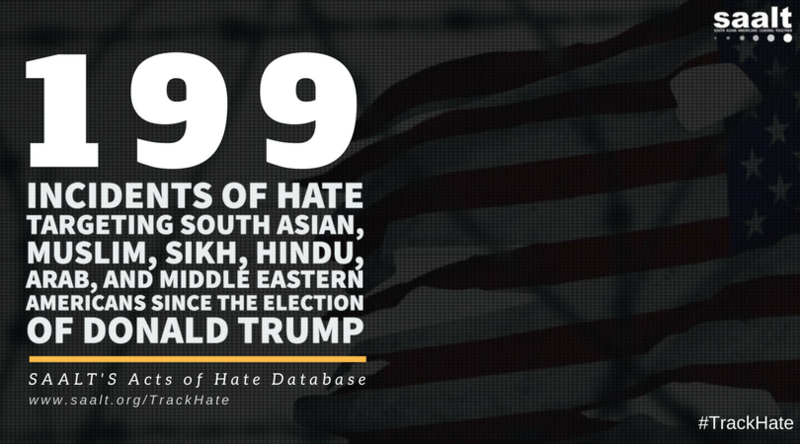 As of November 1, 2017, there have been 199 documented incidents of hate violence against those who identify or are perceived as Muslim, Sikh, Hindu, South Asian, Arab, or Middle Eastern. Most notably, hate violence this year has increased by 53% compared to the previous year. 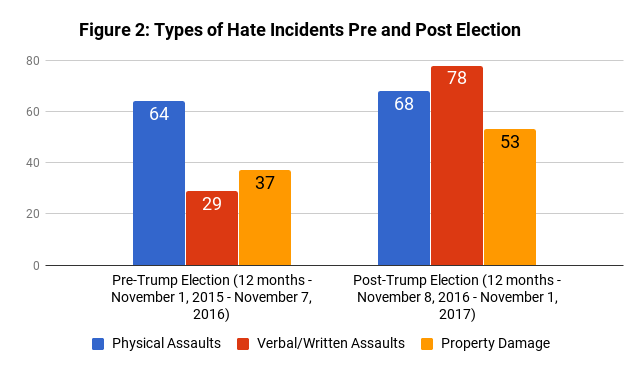 The three categories of hate violence, physical violence, verbal/written threats, and property damage, have all surpassed the totals from the year before the election as well. 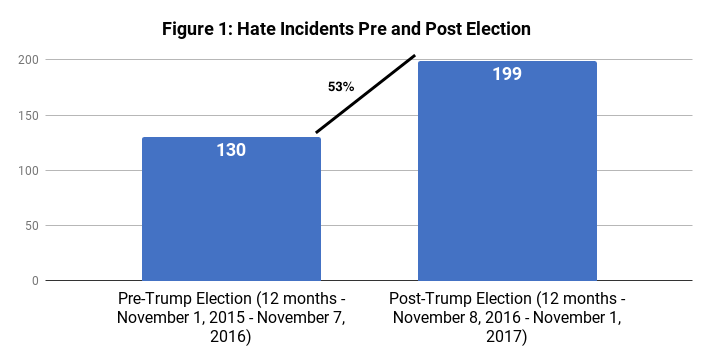 Verbal and written threats and hateful rhetoric are the most common type of violence with 78 documented incidents occurring since November 8, 2016. A recent incident of verbal assault occurred against a Muslim student, Fay Alwattari, at the University of Cincinnati by his music professor. The professor responded to Alwattari’s assignment with a barrage of incendiary comments such as: “The U.S. President’s first sworn duty is to protect America from enemies, and the greatest threat to our freedom is not the President, it is radical Islam. Review this list of Islamic terrorist attacks and then tell me about your hurt feelings.” University of Cincinnati is investigating the professor’s problematic behavior. In addition to verbal assaults, incidents of physical violence also continue to rise with three new incidents occurring in the past week including an attack on a Hindu Temple by an unknown suspect in Lexington, KY. Currently, the total number of physical assaults for this year are 68 incidents. Finally, property damage often consisting of vandalism comprises the third category of hate incidents with 53 unique incidents occurring since November 8, 2016. Just this past weekend, a four foot cross wrapped in bacon was left at a mosque in Twin Falls, Idaho. Local law enforcement are investigating this incident as a hate crime. 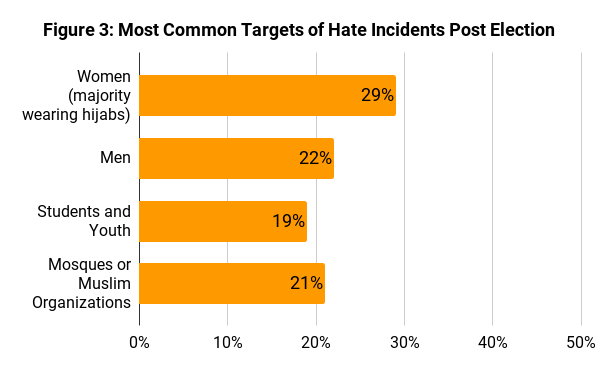 Consistent with the numbers from last week, women who identify or are perceived as Muslim, Sikh, Hindu, South Asian, Arab, or Middle Eastern continue to be the most common target of hate making up 29% of hate violence in the SAALT database. Hate incidents against men, youth, and Muslim places of worship come in second with comparable percentages. Nineteen percent of hate violence is against youth, a slight increase from the previous week. On October 25th, Christopher Beckham harassed two Muslim girls wearing hijabs coming off of a school bus and threatened their father with a knife. He told them to “go back to their country” and that he would kill them when he got out of prison. This entry was posted in alerts, Hate Crimes, SAALT Spot Blog by SAALT. Bookmark the permalink.